Medicare for All can only be achieved through a broad-based grassroots campaign to replace our current broken system with one that serves us all. What good is health insurance if deductibles and copays are so high that they prevent people from getting care? That’s why union nurses are organizing to protect our patients, to heal our broken healthcare system, and to reverse the plague of poor health outcomes in the United States. RN Melissa Johnson and Sen. Bernie Sanders and other Democrats discuss Medicare For All single-payer health care bill.Only Medicare for All will prioritize patient needs over insurance industry greed. It’s time we have a Medicare for all, single-payer health care system that would end health disparities, effectively control costs, and assure that everyone has equal access to an excellent standard of care. We need a single-payer, national health care system which guarantees care for all regardless of their ability to pay. Expanded and improved Medicare for all means everybody in, nobody out. Registered nurses joined actions in over 70 U.S. cities on January 15th to demand that the new administration and Congress protect and expand access to healthcare for millions of Americans — not cut it. 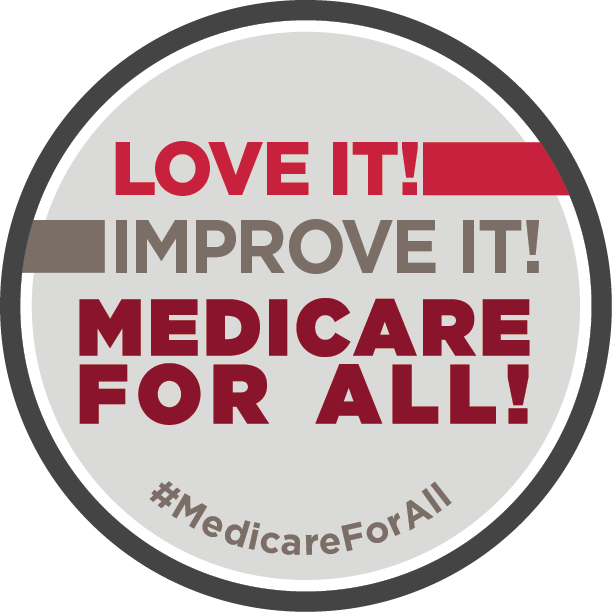 Representatives Pramila Jayapal, Debbie Dingell, other members of Congress, and advocates including National Nurses United (NNU), the nation’s largest union of registered nurses, introduced the Medicare For All Act of 2019 on Wednesday, February 27. © Copyright 2019 - National Nurses United. All Right Reserved.